Check out the 10 minute coverage of the second annual Boschi Pope Skate off featuring top five winners Alex Broskow, Montre Livingston, Jon Cooley, Brian Freeman, Jon Fromm and many more. Filmed by Korina Calderon. Edited by Ivan Higgins. Check out the latest edit from James Perez featuring the Valo team at the Boschi Pope Skate Off. “During the BPSO 2, I managed to film a few tricks from the VALO Squad. I will miss all you guys and hope to see you guys again. Much love. In order, Jon Julio, Austin Paz , Brandon Smith, B Free, Robbie Pitts, Alex Broskow, James Perez, Ivan Narez , Victor Arias.” – James Perez. Check out the first edit of the second annual Boschi Pope Skate Off that went down yesterday. Brought to you by Jordan Baez and Ghetto Community “Yesterday some footage at the BPSO 17. my cams messed up but couldn’t hold back from uploading this. so enjoy it or not but these ppl killed it!” – Ghetto Community. 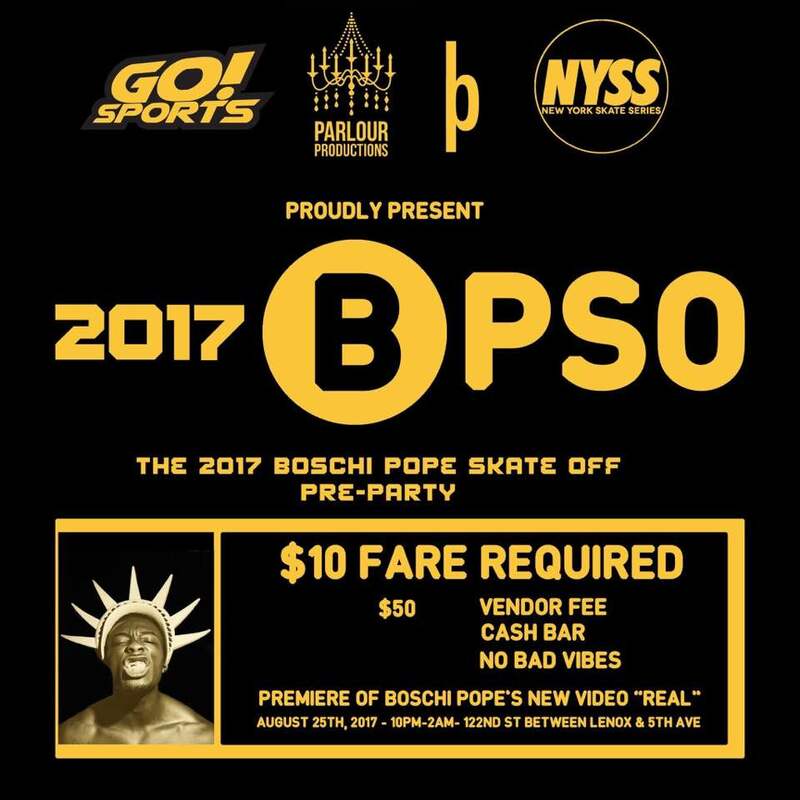 Tomorrow night come out and celebrate another year of the Boschi Pope Skate Off with some of your favorite pro skaters. The $10 entrance fee will help fund Sunday’s competition so be sure to make it out and show your support! Date: Friday August 25th, 2017. Check out the latest edit from James Perez. Filmed by Steven Perez. “My brother and I went skating around our neighborhood in Brooklyn, and we managed to catch a few clips. I decided to throw a little something together. It’s all love and for fun. Enjoy.” – James Perez. Check out the feature length documentary of the New York Skate Series Summer 16 competitions created by Butter TV featuring the creators of the NYSS and the top three winners from all of 2016’s events. “The New York Skate Series, now in its third year, held three events in the summer of 2016: First in Brooklyn, second in Staten Island, and lastly in the Bronx. Get comfy because this is a long one. Watch as Adonis Taylor, Jesus Medina, Craig Benabu, and all the skaters/spectators involved take you through each event and relive some of the good times we all had in the process” – Butter TV. 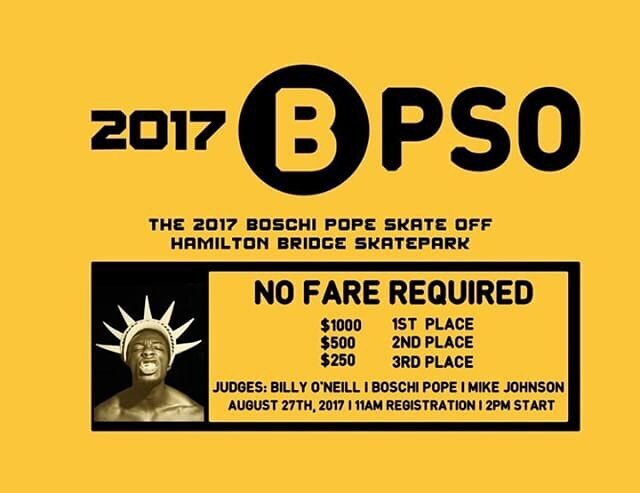 The second annual Boschi Pope Skate off has been announced. Sunday August 27th, 2017 at Hamilton Bridge Skate Park. $1,000 First Place, $500 Second Place, and $250 Third Place. Make sure to RSVP via the Facebook event page. All competitors must sign the digital waiver to enter. Date: Sunday August 27th, 2017. Butter TV linked up with Brooklyn’s Eddie Chung and Chris Santiago after the first NYSS competition to put together this one day edit. “I got a chance to catch up with Eddie after the NYSS: Continental Plaza event in Brooklyn and we talked about whipping together something quick and easy during the middle of the week. We met up in Bushwick along with Chris, made a few stops around the area, and finished the afternoon at the Gantry Plaza in LIC. Good vibes and cool skating– “It was a chill day today.” – Butter TV. Check out the edit from the first New York Skate Series competition of the year. Stay tuned for more info on the next NYSS comp! “The first event from NYSS in 2017 which takes place at Continental Army Plaza in Brooklyn, NY. The format has changed which added tons of small prizes anyone can win through multiple mini competitions. Overall it was small, fun, and filled with positive vibes” – Butter TV.